It wasn’t superheroes, but a kind of retroactive supergroup, that owned the domestic box-office on one of the final weekends of summer. Straight Outta Compton, a kind of origin story of the seminal rap group N.W.A., opened to the tune of $56.1 million. Near as we can tell, that’s the biggest debut ever for a biopic of a musician, besting the $22 million Walk The Line took home a decade ago. In fact, unless Straight Outta Compton takes some sort of meteoric plunge next weekend—an unlikely prospect, given its good reviews and better CinemaScore—expect it to quickly surpass that Johnny Cash flick for the title of highest-grossing musical biopic ever. That sound you hear is a nation of millions (of Hollywood producers) grappling greedily for the rights to a Public Enemy movie. A mixture of nostalgia and timeliness probably contributed to the film’s better-than-projected earnings: While those who grew up on N.W.A. could take a blast to the meticulously recreated past, just about everyone could see something sadly current in its vision of institutional racism and police brutality. 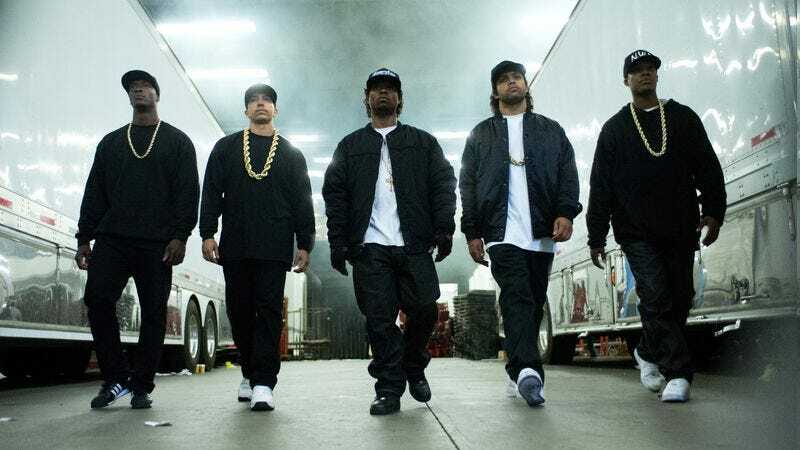 Don’t count out the combined star power of Compton’s subjects either; the movie offered the draw of both Ice Cube and Dr. Dre—or at least guys, related and not, hired to impersonate them on camera. Straight Outta Compton isn’t just the latest, and possibly final, smash of the summer movie season. It’s also the umpteenth feather in the cap of Universal, the undisputed winner of 2015. Seriously, the hits keep coming for the studio with the spinning-globe logo: Their string of smashes includes not just the year’s record-breaking blockbuster juggernaut Jurassic World, but also Furious 7, Minions, Fifty Shades Of Grey, Pitch Perfect 2, and Trainwreck. Did they make some sort of pact with the devil? What secret price, Universal, to you pay for your continued command of the multiplex masses? Nostalgia wasn’t enough to make a hit out of The Man From U.N.C.L.E., whose cast of impeccably dressed pretty people failed to draw in folks with no passing knowledge of the ’60s source material. The film made just $13.5 million, landed in third place, and put another dent in the ongoing campaign to make a movie star out of Armie Hammer. (People did have other options for big-screen spy games, as Mission: Impossible—Rogue Nation held down the number two spot on the charts, adding another $17 million to its American haul.) At least U.N.C.L.E. was able to edge out Fantastic Four, which is falling out of the public consciousness faster than Ben Grimm plummets to earth in that scene that was in the trailer but inexplicably not in the movie. It made $8 million this weekend, bringing its grand total to a measly $41.9 million. Not to kick a flop while it’s down, but expect Reed Richards and company to be straight outta theaters by next weekend.